A military judge blocked several key pieces of evidence Monday that prosecutors said would explain the mindset of the soldier accused in the 2009 shooting rampage at Fort Hood, including his belief that he had a "jihad duty" to carry out the attack. 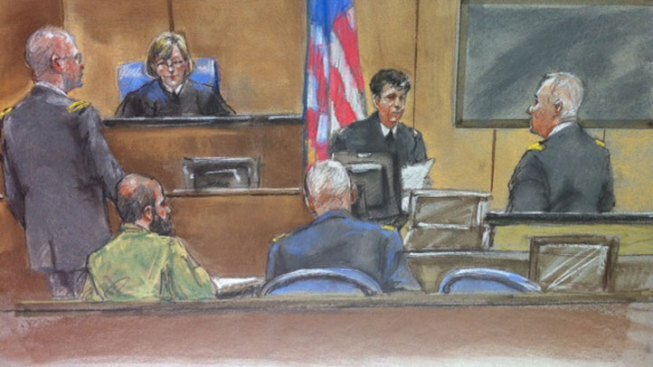 Prosecutors had asked the judge to approve several witnesses and various evidence to support what they allege motivated Maj. Nidal Hasan to carry out the attack, which killed 13 people and wounded more than 30 others at the Texas military base. But the judge, Col. Tara Osborn, blocked nearly all of it. Osborn barred any reference Hasan Akbar, a Muslim soldier sentenced to death for attacking fellow soldiers in Kuwait during the 2003 invasion of Iraq. Prosecutors wanted to suggest that Hasan, an American-born Muslim, carried out a "copycat" attack. But the judge said introducing such material would "only open the door to a mini-trial" of Akbar and result in a "confusion of issues, unfair prejudice, waste of time and undue delay." The judge said prosecutors also couldn't introduce three emails, ruling that the needed redactions would make them irrelevant. The contents of the emails weren't disclosed, but the FBI has said Hasan sent numerous emails starting in December 2008 to Anwar al-Awlaki, a radical U.S.-born Islamic cleric killed by a drone strike in Yemen in 2011. However, the judge will allow evidence about Internet searches on Hasan's computer around the time of the attack and websites that Hasan had listed as "favorites." Military prosecutors have said they would show that Hasan felt he had a "jihad duty," referring to a Muslim term for a religious war or struggle. Prosecutors have called almost 80 witnesses so far, but they weren't expected to begin tackling his motive until this week. Hasan -- who is acting as his own attorney but has mostly sat in silence -- could also soon shed light on such questions, if prosecutors rest their case as expected this week. If Monday were any indication, he may be ready to talk. In a rare move, Hasan spoke up on Monday, first to challenge the government's definition of "jihad" and, for the first time since the day testimony began, questioned a witness. Hasan briefly cross-examined Staff Sgt. Juan Alvarado, who saw a gunfight between Hasan and Kimberly Munley, one of the Fort Hood police officers who responded to the shootings. Alvarado said Hasan tried to shoot Munley after she had been shot and disarmed. "Are you saying -- and I don't want to put words in your mouth -- are you saying that after it was clear that she was disarmed, I continued to fire at her?" Hasan asked. Alvarado said that was correct. The exchange marked the first time Hasan has questioned a witness to the shooting. And earlier Monday, Hasan asked that the definition of "jihad" be adjusted. Prosecutors didn't object, and jurors were told that "under Islam, the central doctrine that calls on believers to combat enemies of the religious belief." Such moments have been rare during the trial, during which Hasan has rarely spoken. In fact, the judge -- once again -- urged Hasan on Monday to forgo representing himself and to allow trained attorneys to take over. Osborn told Hasan she believed he would be better off with a lawyer who knew the rules for military trials, such as when to raise objections and how to spot issues that could be cited on appeal. "Remember when I told you that I thought you would be better off with a trained lawyer, who would know the rules for courts martial. ... You know that," the judge said. "You still wish to proceed pro se?" she asked. Military defense attorneys ordered to help Hasan have accused him of trying to secure himself a conviction and death sentence. Hasan has denied the claims -- but he could face the death penalty if convicted. Prosecutors indicated on Friday that they had between 15 and 25 witnesses left, though it wasn't immediately clear how Monday's ruling blocking much of their motive evidence would affect their case. The ruling also frustrated Reed Rubinstein, an attorney representing victims and their relatives in a civil lawsuit against the U.S. government. He said only in an "alternative universe" could the emails excluded by Osborn be irrelevant. He also blamed the government for dragging out Hasan's case and making some evidence too old to be considered. In Monday's ruling, the judge said prosecutors couldn't cite Hasan's interest years ago in conscientious objector status and his past academic presentations because both were too old and irrelevant. "The reason for that is the procedural pretzels the government has tied itself in to protect Hasan," Rubinstein said, noting that the trial was originally delayed because of a fight over whether Hasan could keep his beard, which violates military policy. Rubinstein said that even if Hasan were found guilty, a conviction that comes without prosecutors introducing Hasan's alleged ties to terrorists in the criminal trial would leave a distaste for survivors of the attack.